I had a crack at making some traditional Cornish Pasties one cold Sunday afternoon, and while I will freely admit that my crimping technique leaves a lot to be desired, the end result tasted pretty damn good! 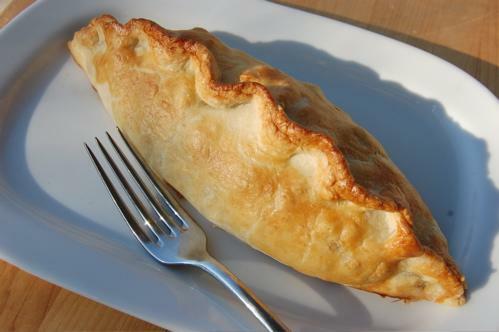 So I now share with you my experience making traditional Cornish pasties! This recipe actually came from a little old lady who lives in Cornwall and makes 4 x 6 inch pasties! Its definitely worth having a crack at making your own pastry, the results are far superior to anything you will get from a supermarket freezer. 450g plain flour – you can get special pastry flour from the supermarket which I personally think gives you better results. Place the flour in a large mixing bowl and stir in a pinch of salt. All the short crust pastry recipes I have ever read call for the use of a food processor to make a butter/flour breadcrumb mixture. I personally don’t have a food processor, so instead I use a big cheese grater to grate the butter and lard into the flour. Stop every now and then and mix your gratings into the flour so it doesn’t end up in one big clump. Start pouring in cold water gradually and mix it into the flour. Its difficult to give you an exact measurement here on the water as it all depends on the flour you are using. You have to do a little bit of guess work here and make sure everything mixes into a ball without being too sticky. Ensure all the flour has been worked into the mixture. Work the ball together, dust some flour on your bench and give it a little knead to bring everything together. Be careful not to overwork the dough. Cover in plastic wrap and let it sit in the fridge for at least 20 minutes. There is no need to pre cook the beef in this recipe, you actually want to put it in the pastry raw. This way as it cooks all the juices will help make a nice gravy! 1.Cut the steak into small pieces – do not use minced beef! 2.Using your peeler, continue peeling the potatoes and swede to create nice thin slices. This gives you much better results than trying to do a fine slice with a knife. Of course if you happen to have a Chinese mandolin, go for gold! 4.Grab a small tea plate, about 15cm in diameter and use it as a template to cut out some circles. 5.Use a pastry brush and brush the edges of the dough with either milk or water to moisten it – this helps make a nice seal! 6.On HALF of the circle, sprinkle a layer of potato, onion & swede mixture. Then add a layer of beef. 8.Be careful not to over fill your pastry, as this will cause it to burst. 10.Sprinkle a little bit of flour and Add a small knob of butter to the top of the filling – this helps make the gravy! 12.Use a small knife and cut a tiny hole in the top to let the steam escape. 14.Place in a hot oven – 220 degrees Celsius – for 20 minutes, then turn the heat down to 160 degrees and bake for a further 40 minutes. 15. Let them rest on a wire cake tray for 10 minutes before serving!